Redoing the fireplace surround quickly updates the look of the fireplace as a whole. Damage, stained surfaces or soot-covered bricks are common reasons for renovating the fireplace surround. Tile is a suitable material for covering your fireplace surround. The tiles hold up well to the heat of the fireplace, and they provide a clean, renewed surface on the front of the unit. A wood frame around the surround will highlight the tiles and provide additional detail to the area. A new surround updates a fireplace. Inspect the fireplace surround to look for damage in the current material. If the fireplace is brick, look for loose mortar or bricks that need to be removed or repaired before being covered by another material. The brick will remain on the fireplace, so you want a stable backing for the new surround. Remove existing tile if the fireplace already has this material on the surround. Use a hammer and chisel to break up the tiles. Wear protective goggles or safety glasses during the removal of the tile. Cover the brick of the fireplace using a thinset mortar that includes a latex additive. Trowel on the thinset so the grout lines are filled and the surface becomes smooth and even. Let the thinset dry overnight. Lay the tiles, starting along the top edge of the firebox in the middle. Spread a new layer of thinset on the area and press the tile into place. Continue installing the tiles, checking frequently with a level to get even rows. Grout the lines by spreading the grout with a float. Wipe away excess with the side of the float. Clean off the tiles with a damp sponge after 30 minutes. Let the tiles set for 48 hours. Attach a wood fireplace surround to the wall so it frames the tiled area. 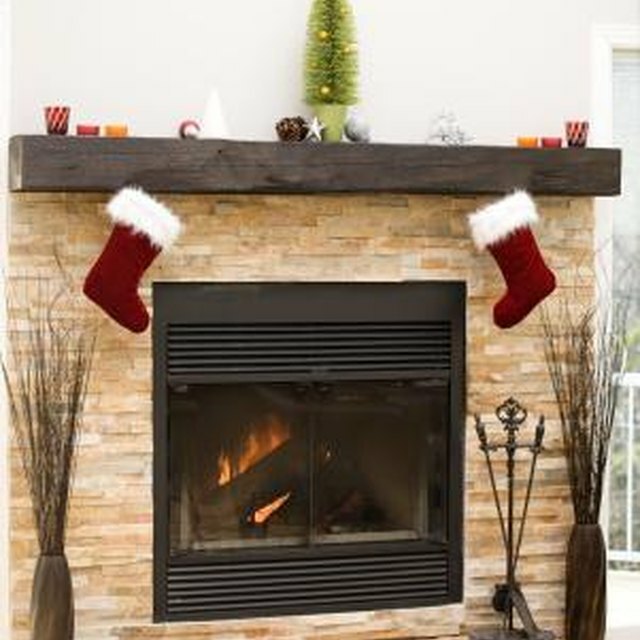 Pre-made fireplace surrounds are available at fireplace shops or home improvement stores.